DREAM Week is Edgewood College’s annual commemoration of the life and work of Rev. Dr. Martin Luther King, Jr. This year Dream Week will be observed February 4-8. There many ways you can get involved with DREAM Week on campus. 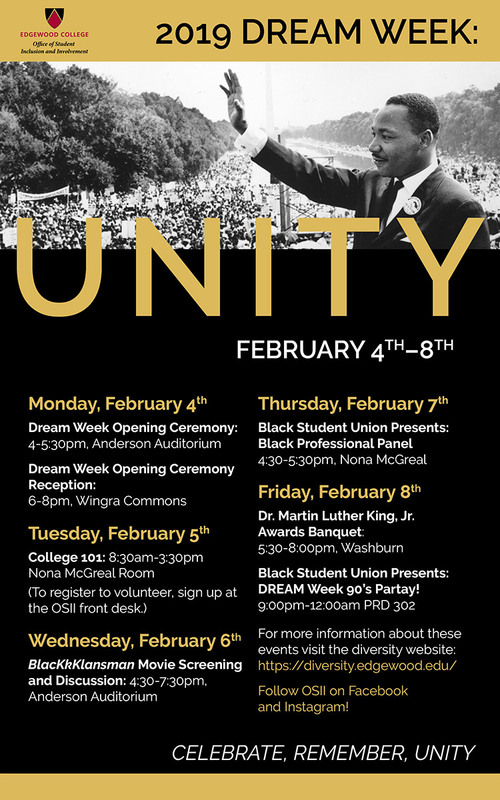 On Monday, February 4 at 4pm, DREAM Week: UNITY begins with an opening ceremony. The ceremony will take place in the Anderson Auditorium and feature a keynote address by Dr. Phyllis Esposito, Director of the Center for Multicultural Education at Edgewood College. Members of the public are encouraged to attend. Too much to remember? Save this poster image to your phone to remind you of these important events.